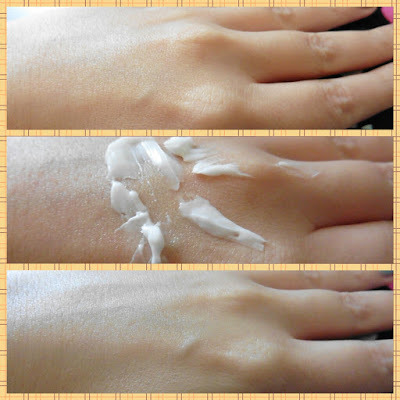 I received a sample of the Tony Moly Panda's Dream White Hand Cream and I decided to try it. So, here's my opinion on this product and some pictures. Ain't the packaging really cute? The smell is sweet, fruity, citrusy and clean. It lingers on for a while so, if you don’t like fragranced products, stay away from this cream. A little goes a long way. I got three uses out of that little sample. Before, with the cream (before spreading it) and after applying the cream. As you can see, it has an immediate whitening effect. The cream is really thick and, even if you only apply a small amount, it leaves a greasy film on your hands. It takes a loooot of time for it to get absorbed or evaporated. No, I prefer lighter formulas and, though this cream does not contain any parabens, Phenoxyethanol is a bit high on the list of ingredients. This cream also has some alcohol in it, which is drying and can irritate the skin.